Yesterday, Medina Service Manager Don Barnett was asked if we would be closing due to the winter storm. Don simply replied: "Absolutely not, our work is much to important to close just for a little snow!" I'd be really mad at the guy that put foot prints in my snow! Well...as it turned out we have indeed closed the stores today (Wednesday). I suppose we are not alone I'm sure some other places may have shut down, this is the biggest snowstorm we've had in a while. Nice picture. 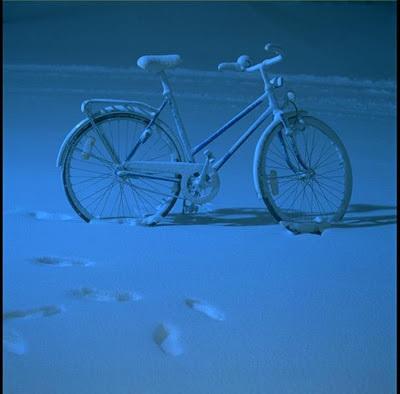 But I would be mad at myself for leaving my bike out in the snow! Maybe the owner of the bike was on his way out to bring the bike in. Once within a few steps of the bike decided it was a nice photo opportunity, then backtracked leaving his own foot prints behind. Therefore he's probably mad at himself on both counts! "We have lost one our members..."